Welcome to this brilliant collection of easy Hanjie! 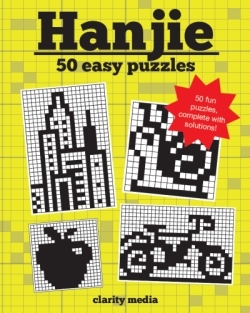 This book is the perfect way to introduce yourself to the fun and interesting puzzle that is, Hanjie! A Hanjie Puzzle Consists of a grid that may be of any width or height. The aim is to fill in the number of squares specified in each row and column to create a picture. Typically, the larger the grid the harder the puzzle though this does not always follow. You will notice at the top and left of the puzzle are a set of numbers. These indicate which cells within the grid are to be filled in. For instance: A '1' next to a column indicates one cell is to be coloured in in that column A '3' means that three cells should be coloured in that column A '1, 1' means that there are two cells coloured in total; and there is a gap of at least one blank (non-filled) square between the two filled squares. All of our books are printed on very high quality paper, making the puzzle experience all the more enjoyable! Due to popular demand, Hanjie volume 2 is now available! Packed with 50 brand new puzzles in a large 8"x10 inch size, this book is another great collection of exciting visual puzzles that we're sure you'll love.